My first experience of Shaman King was in the yearly 00s when the anime aired on Fox Kids/Jetix. To be honest, I wasn’t completely taken by it at first as it seemed a little slow and the narrator of the show bugged me a little. However, I put this down to humble beginnings; I persevered and – as I love stories based on friendship and teamwork – grew to become a huge fan. Shaman King is set on an alternate version of our world where humans called ‘Shamans’ can see and communicate with ghosts. Shamans were once highly respected in the communities in which they lived, but over time as technology and mankind grew Shamans were forgotten until they became just stories of the past. However, the Shaman community still thrived in secret. The story of Shaman King revolves around two young boys Morty (or Mantra in the original Japanese Manga) and Yoh Asakura. Morty, a small and weak boy who has a keen interest in spirits and ghosts, acts as the narrator. Yoh is acts as the hero of the story and is a Shaman. Morty and Yoh become good friends – connected by their love of spirits and the fact that they can both see spirits when most others can’t. This isn’t new to Yoh who has been born into a strong lineage of Shamans, but Morty has always been confused as to why he can see spirits. Yoh early on becomes Morty’s guide to the spirit world. As the story plays out we are introduced to a number of characters who are either human, Shaman, spirit, zombie etc. and the world they live in is fleshed our as we learn the rules of being a Shaman. Shamans have the ability to work with/control spirits and tend to work together with them. Through this collaboration a Shaman can master a number of abilities with the two most reoccurring being: the ability to fuse with a spirit to provide themselves with the strength and skill of that spirit; and the ability to implant a spirit into an object to transform it into a powerful weapon. There are countless others, but I will let you discover these for yourself. The title comes from the Shaman Tournament that is set every 500 years. In this tournament all Shamans that enter have a chance of becoming the ‘Shaman King.’ Once King, this Shaman will become one with The Great Spirit and during this 500 year rule they will shape the entire world. Many people enter the tournament to change the world for the better, but others enter to test themselves against other Shamans. 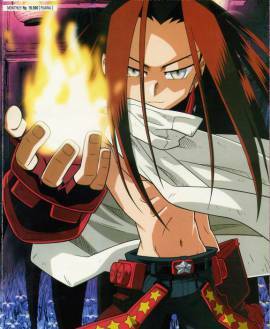 Shaman King is truly epic. The fight scenes are crazy, the characters are hilarious, and the world they live in is amazing. Now, all I’m going to say about the end of the anime of Shaman King is that it is so open ended that it’s screaming for another series, but do we loyal fans get one? Do we heck! Years pass since I watch the anime and I suddenly feel the urge to revisit the world of Shaman King. However, after reading up on the differences between the anime that I watched and its original manga, I decided to give the manga a go instead. This turned out to be a good call as the manga is just like the show… but TIMES TEN. It’s way more detailed and fleshed out than the show – Yoh’s backstory is so much deeper than just a guy who wants to be Shaman King and there are more supporting characters – Shaman and spirit alike. The biggest change though was the ending. In the manga we actually get a proper ending, and one that is completely different to the anime. I’m not going to spoil anything of course, but all I will reveal is that the final ‘boss’ uses a technique that involves him creating a Sun, speeding up its life cycle so it becomes a Super Nova, which then collapses to create a Black Hole, which he then uses try and defeat the heroes. Now if that doesn’t make want you to read Shaman King, I don’t know what will. 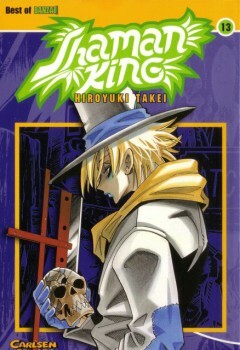 For me there is more to Shaman King than just the action and comedy though. Shaman King is also an education in folklore. From Japanese Samurai to Chinese Warriors, First Nation (Native American) Spirit Animals to Aztec Gods, many myths and legends appear in Shaman King and their cultures are writ large in the design and abilities of the spirits. 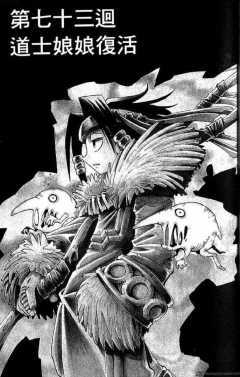 Shaman King also has one of the most interesting villains I have ever read. Hoa (or Zeke in the English translation) is a powerful foe, and the majority of the Shaman King story is about how to defeat him. Hoa is a Shaman who reincarnates every 500 years to take part in the Shaman Tournament. We join the story during his third attempt to claim the throne, and he becomes more powerful with each reincarnation. He wishes to become Shaman King to destroy all the humans in the world, and leave only Shamans, as he believes that humans are destroying the world with greed and technology. His strength is terrifying, his goal is logical but cold, and his skills are intricate. However, he does have a strong and empathetic human side, which is why he is one of my favourite villains of all time. Upon starting this review I thought my nostalgia was blinding me and when I really thought about it Shaman King was maybe just a standard shonen manga about fighting to win. Revisiting it though, I have reminded myself how creative and crazy the world of Shaman King really is, and if you have a love for all things mystic, mythological, and mighty fun, then pick up Shaman King. You will not be disappointed. This entry was posted in Manga Recommendations and tagged anime, cartoon, comic, cosmic anvil, Hiroyuki Takei, japan, manga, recommendation, review, Shaman King, shonen, show. Bookmark the permalink.